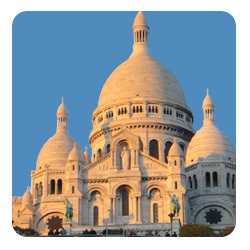 The historical heart of Paris is located where is set Notre-Dame de Paris Cathedral on the Cite Island Both Islands, Cite and Saint Louis are occupied by elegant old private mansion and townhouses of the 17th and 18th centuries. This is the place where you can see the open-air bookstalls and the historic bridges that span the river... The true historical heart of one of the most beautiful city in the wold. Paris has a lot to offer : Visit its museums like Louvre, Orsay, Giverny, Jaquemart Andre, walk its world renowned avenues : Champs Elysees, Saint Germain des pres boulevard, ... Don't forget to take your tickets for the Eiffel Tower or Moulin Rouge Cabaret before eating in one of the restaurant of the world capital of gastronomy. Please select the place you want to see and learn more about history, things to do, shopping, tours or visits available on our site. Let's be clear : Whether your interests lie in the majestic architecture, stunning collections of historic art, world famous French cuisine, or the vibrant nightlife, there is something for every visitor. Unless you are planning an extended stay, expect to leave Paris with many sites unvisited and a full itinerary for your next visit. Here below a selection of places to visit. A few places of interest in Paris : Printemps Haussmann, Galeries Lafayette Grands Magasins, Opera garnier, Place Vendôme, Café de la Paix, Palais Royal, Louvre Museum, Pont-Neuf, Conciergerie, Square du Vert Galant, Notre-Dame Cathedral, Flower market, Saint Louis Island, Holly Chapel, Saint Michel fountain, Orsay Museum, Concorde, Champs Elysees Avenue, Montaigne Avenue, Arch of Triumph, Trocadéro, Guimet Museum, Modern art museum, Eiffel Tower, Invalides, Rodin Museum, Saint Honore street and Rue Royale, Maxim's restaurant, Madeleine Church, Jerdin des plantes, Bastille, Le Marais, Place des vosges, Carnavalet Museum, Hotel Sully, Picasso Museum, Beaubourg, Francs bourgeois street, Saint paul antique village, Pantheon, Montmartre, Moulin Rouge and Lido cabaret, Saint Germain des Pres, Luxembourg Garden, Paris Brasseries ... Paris-city-tour.com is a online reservation website dedicated to sightseeing and tours - We also offer an airport transfer service from either Roissy, Orly or Beauvais airport. Either looking for entrance tickets for a cabaret like Moulin Rouge, Lido or Crazy Horse, a romantic place to dine, a visit to Monet House in Giverny, a Versailles castle full day guided visit or a private transfer to Disneyland ... you will find it on our website. 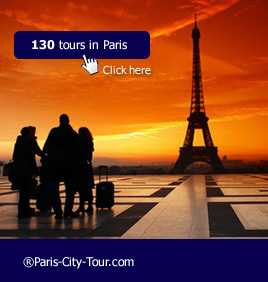 This page features our Paris city guide.